This is a phrase heard regularly by those who travel in political circles or those who care to discuss the multitude of issues currently facing Niagara. Don’t say this phrase or some version of it. Don’t believe it or some version of it. And certainly don’t vote for any politician who says this or makes it a part of their platform for election. “One Niagara” is the most popular Red Herring around Niagara these days. Politicians offer it as a cure-all. The business community presents it as a game-changer. Citizens see it as a money-saver. Usually, the “One Niagara” idea is presented by a party and accepted by all those present as Right and Good in about the same amount of time (and with a corresponding level of consideration) as drinking a Pickle Shot at Sheehan’s. We live in an instant-gratification society and the number one thing going for the “One Niagara” idea is that it allows us all to be lazy. It should be apparent to all who care to think that there are various complex and unique issues facing Niagara and its communities. But that sort of rational thinking gets swept away when presented with a one-size-fits-all, immediate cure for what ails us. “One Niagara” let’s us believe there is a one way to make this area great again. And look, we barely had to lift a finger. Saying One Niagara immediately gives off the perception that an individual knows and cares about Niagara. Whether they can elaborate on the specific solutions One Niagara gives isn’t relevant. This is a person who GETS IT and further discussion of the social, economic or political issue at end is not required. Why examine the condition of the working poor when we can’t even figure out One Niagara? Here’s the thing about One Niagara that’s the real kicker though: it is a horrible idea. The worst part about the idea isn’t that it is lazy, or that it allows politicians to pass the buck or that it curtails discussions of actual problems and solutions, or even that it is based on flawed logic. 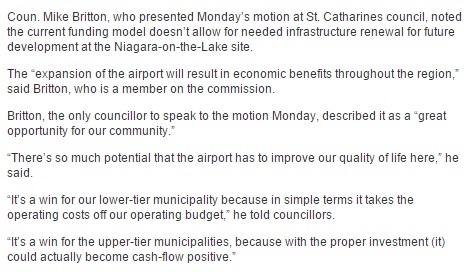 The worst part of “everything would be better if Niagara was One Municipality instead of 12” is that it is wrong. Amalgamation was a far more obvious choice in Ottawa and Hamilton, single urban centres that absorbed their supporting surrounding communities. And guess what? In spite of their more apparent rationale for amalgamation, they have hardly been successful. From the Rural Council, representing the communities lost in amalgamation: “Amalgamation: The Costly Experiment That Failed” (http://www.ruralcouncil.ca/amalgamation.htm). In Hamilton: “Singing The Amalgamation Blues” (http://www.raisethehammer.org/blog/872/). I could post links all day that mention the same problems, but these two give a succinct idea of the effects of amalgamation in those communities. “Contrary to the provincial expectation that amalgamations would result in more efficient service delivery, in every jurisdiction the majority of respondents felt that the value they were receiving for their taxes declined since amalgamation” (http://www.cjrs-rcsr.org/archives/26-1/siegel.pdf). Citizens also have generally been more against amalgamation than for it in all three places. Amalgamation has failed in every municipality it has impacted. It will fail here. We won’t see lower taxes, we won’t see less spending on politician/public sector salaries, we won’t see higher employment rates and we won’t see improved transit as a result of amalgamation. One Niagara would only make our issues worse, not better. Everyone suffers from confirmation bias, myself included. So it’d be fair for you to think that I just found the sources that told me One Niagara was bad because that’s the conclusion I wanted. That’d be fair. So look into the issue yourself. Take the time to be able to back it up before spouting One Niagara. As for me, I won’t ever be voting for anyone who says One Niagara is our solution; they either: 1. haven’t done the research 2. Have done the research and are not competent or 3. Are simply trying to pass on finding real solutions to issues. Let’s expect more Niagara. Let’s focus on real solutions and not fall victim to a red herring. This entry was posted in NiagaraVotes2014, One Niagara, Politics and tagged amalgamation, One Niagara, politics, taxes, transit on September 16, 2014 by greg miller.